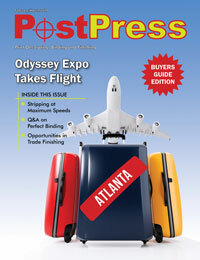 The following articles were originally published in InsideFinishing, a niche-market magazine that targeted graphic finishers, label manufacturers, carton manufacturers and more with a focus on decorating technologies, including foil stamping, embossing, cold foil technologies, specialty coatings, laminates and laser cutting. InsideFinishing ceased publication at the end of 2014, when it merged with The Binding Edge, another trade publication that covered the binding and loose leaf industries, including trade binderies, commercial printing facilities with in-house binding and finishing capabilities, book production facilities and manufacturers of loose leaf products. by Francis Shea, M. Digital, Inc.
by Mike Adams, Adams Technologies, Inc.
Ejection Rubber Dilemma: Durometer or Compression/Deflection? by David West, Essential Products, Inc.
Why Be Remarkable at All? by Christopher M. Leary, W.H. Leary Co., Inc.
by Roger A. Brown, Monroe Rubber & Plastic, Inc.
by Imants Ejup, Director R&D, Business Development, Transilwrap Company, Inc.
by Mark Baril, Cut Smart Manufacturing, Inc. Workplace Safety  Is It a Benefit or a Curse? Why Do You Need a Radiometer for UV Coating? Foil Stamping Strengthens Brand Identity – It’s a Fact! by Terry Gallagher of Total Register, Inc.
by Robert Larson, President of Larson Worldwide, Inc.
Q&A: Is UV-Coating the Right Choice for You? Capital Equipment – When Should I Buy? Q&A: What is the ANSI B65.5-1996 & How Does it Affect Me? by Robert Weidhaas, Jr. of Preco Industries, Inc.
Q&A: What should a buyer look for when considering the purchase of folding/gluing equipment? What Sets UV, Aqueous and Laminates Apart? Q&A: What type of safety standards are available for graphic finishing operations? by March Love, Atlas Die, Inc.
Q&A: What are my concerns when overprinting foil? Q&A: What type of system is recommended for storing steel rule dies? Q&A: How do I begin a maintenance program for my stamping and die cutting equipment? Q&A: How do I get the most out of my multi-level embossing? Q&A: How can I stamp a large solid and fine type together in the same pass? Previous articleThe Economists View: Steel Tariffs  Good, Bad, Both?